Immunotherapy or adoptive cell therapy has been hailed as a game changer for cancer treatment. It involves harnessing the power of the body’s own immune system to help fight cancer. T-cells are key players of the immune system that not only play a pivotal role in antigen presentation and destruction of diseased cells but also aid as an important biomarker for clinical research and drug development. In response, tumor cells have developed mechanisms to evade recognition by T-cells. To circumvent this tactic, researchers have genetically engineered T-cells to express receptors that specifically recognize cancer antigens. Currently, T-cells are modified with two receptor types: conventional T-cell receptors (TCRs) and artificially generated chimeric antigen receptors (CARs). A TCR is a membrane protein complex, recognizing antigens as peptides bound to the major histocompatibility (MHC) complex which induces a cascade of intracellular signaling. TCR detects tumor-specific proteins on the inside of the cells providing a wide array of potential targets. A synthetically generated CAR targets antigens that are specifically expressed on the surface of B-cell tumors. CARs are less complex than TCRs, as they recognize a limited range of antigens; however, they can be custom designed to target different molecules. This article presents two applications using electroporation-mediated genetic engineering of T-cells with receptors that are able to detect tumor-associated antigens (TAAs). These include trifunctional CAR T-cells and an RNA-based TCR kit to control the T-cell bioassay. The overall scheme was to build an optimal CAR architecture containing CD20 (B-cell antigen) mimotopes (macromolecules that mimic the structure of an epitope) that are non-immunogenic and specific for rituximab binding (rituximab is a monoclonal antibody that targets CD20). Fourteen CD20 mimotopes were tested. The mimotope was engrafted onto a second-generation CAR construct designed to target B-cell maturation antigen (BCMA) that is specifically expressed in multiple myelomas. In addition, two constructs enclosing a human CD34 epitope, a marker for hematopoietic stem and progenitor cells, were also assembled. The constructs were transfected in primary T-cells as mRNA by electroporation using BTX AgilePulse Max, and they were screened for expression on the T-cell surface, antitumor activity, and depletion by rituximab (Figure 1). Activated primary T-cells isolated from peripheral blood mononuclear cells (PBMCs) were collected, and four days after their stimulation by human T-activator CD3/CD28, the cells were transfected with mRNA encoding for second-generation CAR constructs (Table). The transfection efficiency was measured by flow cytometric detection of transient expression of CAR constructs on the surface of primary T-cells and their ability to bind to the BCMA protein; the efficiency ranged from 70–90% for the 14 CD20 constructs tested. The CAR+ T-cell viability, which was determined by the ability of CAR constructs to promote T-cell depletion using rituximab-mediated cytotoxicity assays, ranged from 30–100% of the 14 CD20 mimotopes tested. The researchers genetically engineered an all-in-one CubiCAR construct that may prove to be a safer alternative to the existing CAR T-cell based immunotherapies. While CAR T-cell therapy has achieved clinical success in a few tumor types, the repertoire of surface proteins required to target multiple tumors, especially solid tumors, is currently unavailable. To address this issue, many research groups are currently developing therapies that incorporate TCR-engineered T-cells that can recognize antigens inside solid tumors. The biggest hindrance to the broad clinical adoption of TCR T-cell therapy in clinical settings is the antigen-cross presentation and cell-based immunoassay variation when monitoring T-cell responses. Immunoassay is a critical component in the development of novel immunotherapies as it helps identify the right antigen and establishes TCR avidity. Bidmon et al. have developed an easy-to-use immunoassay kit to engineer novel reagents that contain a defined number of functionally characterized antigen-specific T-cells, by electroporating RNA-encoded TCRs into primary lymphocytes.2 Stable HLA (Class I or II restricted TAA) -specific TCR-engineered reference samples (TERS) were generated with a broad range of CD8+ and CD4+ T-cell specificities that can be repetitively used for T-cell assays to control immune assay performance. The TERS kit comprises TCR-RNA with an extended RNA stability and an optimized user-specific manufacturing protocol to enable consistent, high-throughput generation of TERS. To produce the TERS immuno-control kit, PBMCs isolated from HLA-A*02-positive donors were transfected with control GFP-RNA or the Flu-TCR RNA (wild type human Influenza58–66). The group used six electroporation devices. 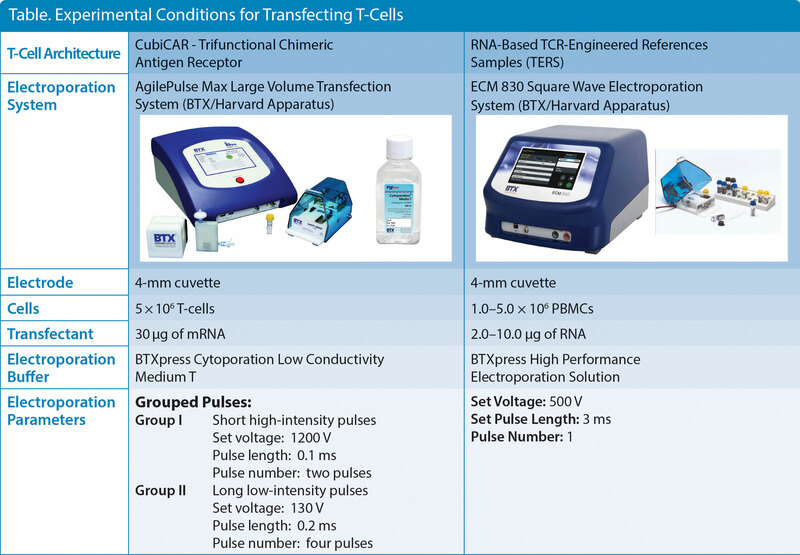 High transfection efficiencies of up to 97.3% antigen-specific CD8+ T-cells and high viability up to 96.0% were obtained with the ECM 830 electroporation system from BTX/Harvard Apparatus (Figure 2, Table). A TCR RNA stability test was conducted to assess shelf life and the quality of RNA, guaranteeing the TCR RNA stability at –80?°C and 2–8?°C for at least 24 months of storage. As a proof of concept, two stability-tested TAA-specific TCR-RNAs, NY-ESO-1 (human tumor antigen highly expressed in melanomas) or chimeric tyrosinase368–376-specific α + β TCR RNA (highly expressed in primary and metastatic melanoma lesions) were used in the TERS production process and tested by investigators from six labs using three commonly used T-cell assays including MHC-peptide multimers, cytokine flow cytometry, and ELISPOT assay. The aim of the study was to enable the development of an electroporation-mediated RNA-based kit for the generation of TCR-engineered reference samples. The TERS technology provided reproducible results across multiple institutions, demonstrating a robust method for the control of immunoassay performance to enable the development of diagnostic tools and novel therapies. Figure 2. Optimized electroporation setting for the generation of TERS. There has been tremendous progress in developing T-cell based immunotherapies that can address the increasing prevalence of carcinoma with poor prognosis. In this effort, electroporation has served as a powerful tool to efficiently generate modified T-cells for TCR-based or CAR T-cell based immunotherapy. The consistent efficiency afforded by transfection through electroporation will continue to accelerate translation of these emerging therapies into the clinic. Radhika Dixit, Ph.D. (support@hbiosci.com), is an applications scientist, BTX, at Harvard Bioscience. 1. Valton J et al. A versatile safeguard for chimerie antigen receptor T-cell imunotherapies. Nature 2018; 8: 8972. 2. Bidmon N et al. Development of an RNA-based kit for easy generation of TCR-engineered lymphocytes to control T-cell assay performance. J. Immunol. Methods 2018; 458: 74–82.